To investigate your bridging finance and mortgage options call our mortgage team on 0117 313 6058 or fill in our call back form. Sometimes getting the necessary cash together to secure your perfect auction property can be a challenge, but fortunately there is a specialist type of short term loan, designed for property owners, which could help. A bridging loan is a type of loan designed to get you the funds you require faster time frame than with conventional mortgages. How can a bridging loan help with auction property finance? If you plan on buying a property at auction, it is essential to be aware that the process moves quickly. To secure the property, you will be required to pay a percentage of the property’s value on the day of the auction. The remaining money will then be paid within a short time frame, usually around 28 days. The fast-paced nature of the property auction process means you need to be completely ready to pay before the auction even commences. If you do not pay up within the required timeframe, you could lose not only your property but also your deposit (up to 10% of the value of the property). A decision can be made within hours of the initial enquiry to the lender, and the money can be made available within days. This allows the bidder to easily complete the auction purchase within the time frame specified by the auction company. You could also use a bridging loan to pay the 10% deposit required, provided that you agree this with your bridging loan provider prior to the auction date. You may be able to secure the bridging loan against any current property that you own, and of almost any type – residential, commercial or even land only. Bridging finance provides a good short term solution for moving quickly, but it is expensive debt. Replacing this debt with a mortgage is something you would want to do fairly quickly once you have secured the property at auction. We can help with this process by calling us on 0117 313 6058 - call us with your requirements or complete our callback form. 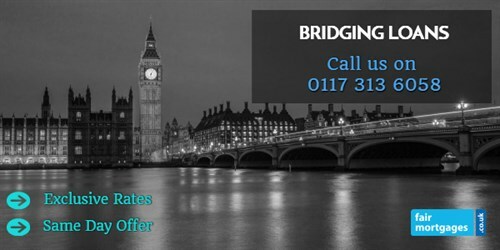 Call us for a FREE initial conversation on 0117 313 6058 about bridging finance options for auction property purchase or request a callback.